The later part of the headline is kind of catchy, isn’t it? The wrath of the killer cells. Probably sounds like a video game from EA sport, or an animation movie like The Killer Beans. But killer cells are not related to all that; they are in fact, essential parts of the immune system. Firstly, let us understand what killer cells and ADCC are. Some important components of the immune system are called the antibodies. Otherwise called immunoglobulins, these are glycoproteins secreted by the mature and differentiated B cells (a.k.a. plasma cells), and they form the humoural part of the adaptive immune system. The other part, the cell-mediated arm, involves the T cells. A typical antibody looks like the picture here, like a letter Y. The two arms in the upper part of the Y is for antigen binding (antigens are substances ‘foreign’ to the body), and are called the Fab region. The lower part is for binding of series of components in the immune system called the effector components, which include complement proteins and the killer cells. This is termed the Fc region. There are different types (isotypes) of antibodies and they include IgA, IgD, IgE, IgG and IgM, where ‘Ig’ stands for immunoglobulin. 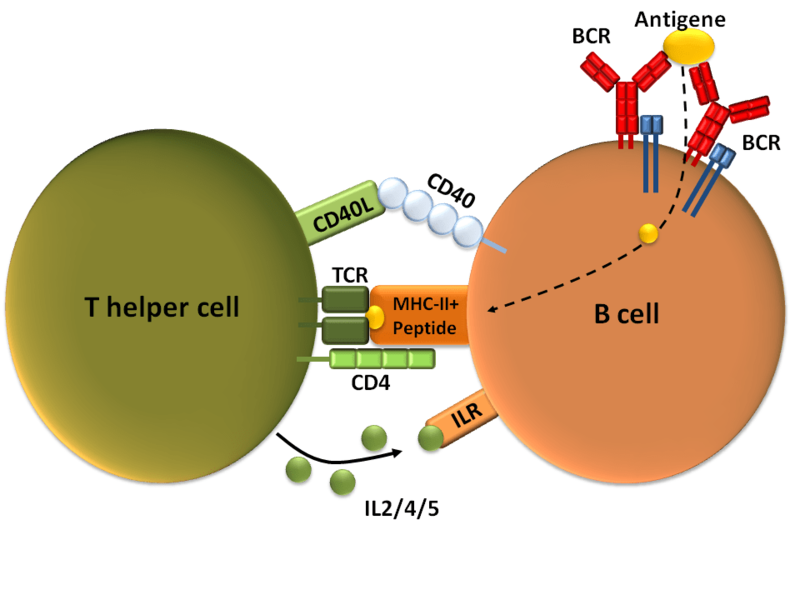 Some antibodies are fixed on the B cells and act as receptors for these cells (Examples: monomeric IgM and IgD). Some are however secreted by activated plasma cells when induced and are usually circulating in free forms around the body, probably as scouts against any foreign materials (Examples: secretory IgA and pentameric IgM). This is a very effective mechanism of detecting the presence of potential disease-causing agents in the blood or other body fluids like the breast milk. Once an antibody encounters a foreign pathogen such as a microbe, it binds to it through its antigen binding region (Fab) to sites referred to as epitopes. The more the number of epitopes on the bacterium, the greater the number of antibodies which would bind to the microbe. In some cases, this might lead to a phenomenon called opsonisation, in which the antibodies act asopsonins, substances which enhances phagocytosis by cells like macrophages and neutrophils. In other cases, it leads to the process of antibody-dependent cellular cytotoxicity (ADCC). ADCC is a phenomenon which uses some immune cells as its effector components, referred to as the killer cells. These cells are mainly cells of the innate immune system which possess Fc receptors (FcR) on their surfaces complementary to the Fc regions of antibodies. Killer cells include natural killer cells (NKC), macrophages, monocytes, neutrophils and eosinophils. These cells are usually termed professional killers because within their structures, they individually possess a vast array of potent chemical substances which when released are capable of damaging any cell targeted, either microbe or host cell. These substances include lytic enzymes, perforins, granzymes and tumour necrosis factors (TNFs). When any of these killer cells is bound to any target microbe through the Fc-FcR connection via antibodies, it becomes metabolically active, secreting large amounts of these potent chemicals and releasing them in close proximity to the target microbe. Each of these chemicals has specific ways of killing the target microorganisms or unfortunately, usually the nearby host cells. Perforins, as the name implies create pores on the membranes of the target microbes or cells which serve as an entry point for granzymes, whose mode of killing is to induce apoptosis (self-programmed death by cells) through a series of cascade actions starting from the mitochondria. This mechanism is usually employed by NKCs and eosinophils. Lytic enzymes are produced by macrophages/monocytes, neutrophils and oesinophils. They attack cells by creating numerous pores on the cellular membrane, leading to loss of cell integrity and death through influx of fluids into the cells. TNFs effect cell death by binding to their receptors (TNF-R1 in all cell and TNF-R2 in immune cells), leading to conformational change in the receptors, whose actions ultimately lead to the induction of death signal in the target cells. TNF are secreted by macrophages and NKCs. Perhaps all these sound intriguing and exciting because we are primary being protected by this phenomenon of ADCC. Unfortunately, sometimes these killer cells usually turn their rage against the host own cells, causing massive injury to the body. This is usually as a result of autoimmunity, hypersensitivity or Immunopathology. For more on all these click here. But before we get scared of our own immune defenses, we should be comforted by the fact that they are primary there to protect us from external aggression and hope one day they won’t turn their wrath against us.